For iPad® and most Brands of 7” ~ 10” Tablets. For all generations iPad, iPad Mini and most 7 - 10.1” tablets, including Galaxy tablets, Motorola Xoom, ViewSonic tablet, HP Touchpad as well as touchpads from Acer, Asus, Vizio. 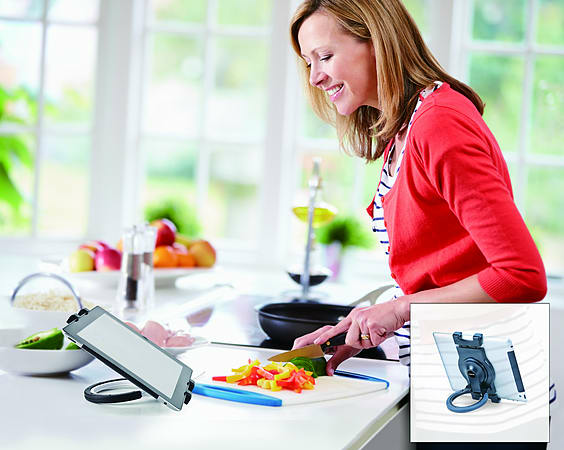 This universal tablet stand is designed to be a multi-function unit. It offers handheld, desktop and even hanging capabilities. The tablet holder is built with an adjustable spring clip that fits all generations iPad, iPad Mini and most 7 - 10” tablets, including the Kindle Fire, Samsung Galaxy, Motorola Xoom, ViewSonic tablet, HP Touchpad as well as touchpads from Acer, Asus, Vizio, and Toshiba.